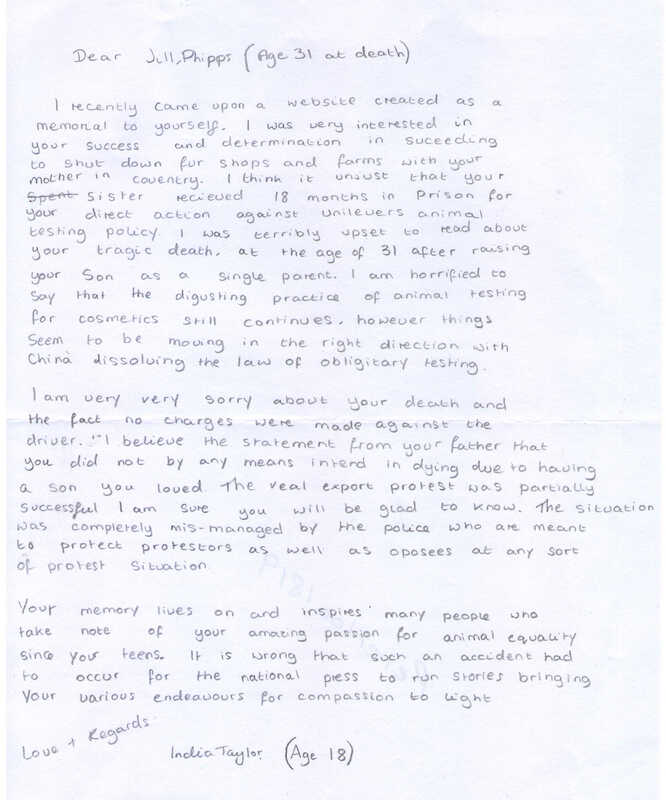 To Jill Phipps, British animal rights activist. From India Taylor. I recently came upon a website created as a memorial to yourself. I was very interested in your success and determination in succeeding to shut down fur shops and farms with your mother in Coventry. I think it unjust that your sister received 18 months in prison for your direct action against Unilever’s animal testing policy. I was terribly upset to read about your tragic death, at the age of 31 after raising your son as a single parent. I am horrified to say that the disgusting practice of animal testing for cosmetics still continues; however things seem to be moving in the right direction with China dissolving the law of obligatory testing. I am very sorry about your death and the fact no charges were made against the driver. I believe the statement from your father that you did not by any means intend in dying due to having a son you loved. The veal export protest was partially successful I am sure you will be glad to know. The situation was completely mis-managed by the police who are meant to protect protesters as well as oposees at any sort of protest situation. Your memory lives on and inspires many people who take note of your amazing passion for animal equality since your teens. It is wrong that such an accident had to occur for the national press to run stories bringing you various endeavours for compassion to light. British animal rights activist. Born 1964, died 1995. More information about Jill Phipps.